As of this writing, my new job and then the world’s pre-eminent boardgame convention have kept me too busy and/or access-blocked to do much in the way of reviewing. Well, no, that’s not right. As you can see, I’ve been reviewing, I just haven’t been posting them. The previous one, I think about a movie I saw a week or two ago, has been sitting in my inbox for days waiting for me to punch up the HTML and then post it. On the (let’s say) bright side, I haven’t had time to fall farther behind, so I’ve got that going for me at least. Remember when I read the conclusion of the Hack/Slash series, about a teenage serial-killer killer who was opposed by the shadowy cult responsible for all those supernatural horror slasher guys that gleefully dismember summer camp teens? Like I said then, it turns out more books have been written even though the story ended. 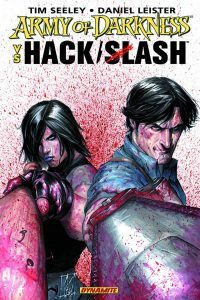 I appreciated, therefore, that the plot of Army of Darkness vs. Hack/Slash went out of its way to acknowledge this. Cassie Hack is retired, dealing with the mental trauma of her losses, and living the least intense life she can find. Until, you know, Bruce Campbell shows up to get her to team up with him to fight against the Necronomicon and its army of Deadites. Like all good team-up / crossover comics, they fight each other as well as common enemies; and like very few team-up / crossover comics, they change along the way, paving the road for future events. Well, I mean, Cassie does; I have no idea about Ash due to lack of familiarity with his comic, but since growth is anathema to the on-screen version of the character, it’s probably fine that he did not appear to. Also, I’m pretty sure there will be future events in store for Cassie’s life. I have no idea how many, though. If so: probably they will continue to contain explosions of bloody gore, supernatural mysteries, and lingerie cheesecake. I mean, not literally Bruce Campbell. It’s actually Ash from the Evil Dead movies and that new show on Starz, but you probably already knew that. For the record, he’s still young Ash, no more than a few years after Army of Darkness. He is apparently the topic of a different comics series I do not (and probably will not ever) read. This entry was posted in Words and tagged graphic novel, horror on November 21, 2016 by Chris. I know that Doctor Strange occasionally crosses over with other characters in the Marvel universe. I mean, maybe someday he’ll be at the heart of a big crossover event, but as of 15 years of Ultimate comics and 20 years of mainstream comics, he has only ever been at the fringes. And this is a thing that makes a lot of sense! Except for the artifact of history that Stan Lee decided to build a stable of shared characters in the early 1960s to compete with what DC had been doing, there’s no way anyone would say Strange fits into Marvel. Different genre than anything else they publish, and an entirely different style to boot. The only thing that comes close is Thor, and that’s only because they both share a love of stilted declamations. Do I have a point, here? Maybe. 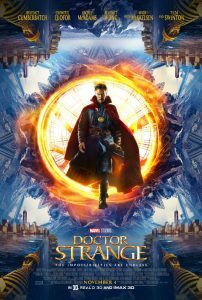 See, as promised in a blink and you missed it scene in The Winter Soldier, Marvel Studios has dropped a Doctor Strange film onto an unsuspecting public. And sure enough, there is no apparent connection between it and any other movie they’ve made, at first glance. But this is fine, because unlike some Netflix series I could name, Avengers Tower is prominent in the midtown skyline. Even better, both the characters with names and dialogue and the pedestrians in the background are becoming more comfortable with the bizarre turns of events that occur with increasing regularity in their world, just as befits a maturing familiarity with superheroes. I would not have thought to be so appreciative of a touch like that, but I don’t think I would have thought to expect such a touch in advance, and yet here we are. Normalcy. I dig it. Anyway, all that’s about the world and setting. The actual movie, though? See, Stephen Strange is the best neurosurgeon in the world, but after a series of unfortunate events related (mostly) to his personality, he finds himself seeking alternative answers about his place in the world. It took Stan Lee and Steve Ditko maybe three pages to establish all of this before turning Strange from a doctor into a sorcerer, and it took the movie a good 45 minutes. Now, don’t get me wrong, Lee has never written under the auspices of “show, don’t tell”. Man loves to tell approximately as much (and as floridly) as PT Barnum did. But at the same time, 45 minutes is a lot of celluloid to squeeze out of three pages. Maybe there is some kind of middle ground? Like, I would never say they should have skipped the origin story entirely, because who has heard of Doctor Strange? The good news is, that’s the only bad thing I have to say about the movie. It is a feast for the eyes, and moreso in 3D (unless that kind of thing makes you ill), and if the plot is a little bit bog-standard good v evil for modern Marvel, to be fair fantasy and spellcraft kind of lends itself to that. And even so, it’s far more nuanced than you might think from what I’ve said. Not-apparently-a-Baron Mordo in particular is fully realized in a way that never would have been predictable based on his turn in that same initial Lee/Ditko comic I mentioned before. Tl;dr go see it, they’re not out of juice yet. I mean, if you discount years of announcements and months of previews. Look, nobody asked you. At second glance, this is completely untrue, but only because the writers made an effort to relevance that I cannot decide if I appreciate or oppose. That is in full on spoiler territory, however, so I shall say no more. This entry was posted in Film and tagged 3D, action, fantasy, Marvel, superheroes on November 21, 2016 by Chris. Back when I read The Alloy of Law, I said it was a feature that my brain had already erased everything except the broad outlines of what had happened in the Mistborn trilogy. This is because the characters are living 300 years in the future created by their new god, and most of what happened in the short months or years during which the old empire fell and he rose are already the stuff of half-remembered legend instead of researched historical fact. 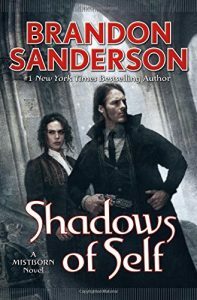 Well, now that I’ve read Shadows of Self (at a glacial pace that reflects how busy I’ve been these past months rather than anything about the book or my enjoyment thereof), I can safely say that is no longer a benefit. Because the characters definitely remember things like kandra, which are a race of shapeshifters that require other living things to not be formless balls of glop (at least I think that’s right), and also they need metal spikes to have intelligence. And they are also god’s butlers or angels or something, serving both the old god and the new. I mean, not right now, but respectively. Oh, and one of them has maybe gone crazy. This is the first book of a trilogy, I guess? Or maybe the second of a quartet, I’m not sure how to tell the difference yet. It’s definitely good, and good to see Wax and Wayne and Marasi back in action. Both because I already liked them and because they continue to grow and backfill and change. On top of both plot and characters I approve of, it’s a book about identity, class politics, and freedom vs. servitude. And maybe even alien invasion? I mean, probably not the last thing. Don’t get me wrong, I apparently picked up on all that eventually, but it definitely felt like I shouldn’t have been playing catch-up. This entry was posted in Words and tagged Cosmere, fantasy, Mistborn on November 12, 2016 by Chris.